Just because it's cold outside doesn't mean we want to pass up on our exercise routines. Staying healthy and active is, after all, important in every month. The good news is, no matter how cold, there are ways to safely keep yourself in shape or well. If you like exercising outside, whether it's running in your favorite park or power walking around your neighborhood, it can be a challenge to stay warm while adhering to your routine. You want to be comfortable and free to move, but you also want to avoid hypothermia or even just avoid unnecessary discomfort. 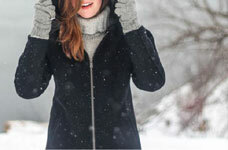 One of the best ways to keep yourself at an optimal temperature is to layer your clothing. Get a good thermal base layer to go under long-sleeved and full-legged workout gear, and don't forget a jacket or sweater to keep you insulated. Just as important as a base layer is a warm hat to keep in heat, as it's thought that half the heat you lose is through your head. If you do your warm-up outside in the cold, your muscles may not have the chance to properly loosen up and relax, and you run the risk of injury. It's important to do your basic stretches and a brief aerobic activity like squats or jumping jacks to get your joints going, inside, where it's warmer. If you don't have any space inside to begin your workout, then give yourself a longer period at the start of your routine before you push yourself. An extra five minutes should be sufficient to warm up your muscles and joints properly. If it's too cold outside, no matter how layered you are, no matter how long you warm up in a heated environment, you run a risk exercising in dangerous conditions. A good idea is something called the "15-Degree Rule." If it is below 15 degrees Fahrenheit, it is too cold to work out outside. Try to keep your routine on solid ground, as ice or snow may increase your risk of falling or pulling or tearing a muscle. While you want to dress warmly, don't overdress. You're going to be building up heat as you exercise, and sweating in the extreme cold can be unpleasant at best, dangerous at worst. It's an excellent suggestion to take a friend with you on whatever route you have planned out. If one of you starts to feel disoriented, a side effect of hypothermia, or if you trip on a slick patch you didn't see, the other is there to help. One good way to keep on top of your workout regimen is to take it indoors entirely. If you get a few core accessories, you don't need to sacrifice oodles of space in your home. An ottoman or a medium-sized basket can hold your goods, which you can tuck away in the corner of the living room if you can't devote an entire room to your personal gym. You'll want to get a some basic equipment, preferably things that are easy to store and can serve multiple purposes. A yoga mat is an excellent place to start, not only for warmups and cooldowns, but any floor work you do will be more comfortable. Plus, you'll keep sweat off the carpet or flooring as yoga mats are more easily cleaned. Dumbbells are perfect for your home gym as they, too, can be adapted for more than one purpose. A Bosu balance trainer is a good addition, as you can use it to enhance your workout. Adaptable resistance bands, similar to dumbbells, can be used in many ways to give you a full-body workout with limited equipment. No matter what you choose to do to stay fit this winter, keep yourself safe. Sometimes, it's easier and a wiser idea to stay inside and out of the elements. If you do, make sure you have what you need to get the best workout possible. Remember, just because it's cold doesn't mean we should give up on our goals.